Why should you be making a yeast starter? This highly debated subject has many opinions about it. The bottom line is that there is safety in numbers. The more yeast – in general – the better, or safer you’ll be on brewing day. Use common sense, for too much yeast does not make better beer. I always make a yeast starter for liquid yeast and it has worked very well. The lag time is minimal and concern about wild yeast or bacterial contamination is reduced or eliminated. Dry yeast is dehydrated, resting until it is rehydrated. In the dried state, the yeast are shrunken and their numbers are great. For most beers, use the Basic or Normal Gravity Starter for beers with a starting gravity of about 1.040 to 1.060. If 1.060 or greater gravity brew is being made, a Step-Up Starter is best. Add the two batches together and let them ferment another 18 to 24 hours. Starters are best used when the yeast is very active. Caution: If a starter is allowed to stay warm for too long, bacteria or wild yeast can “invade” your mixture – even if covered – since it has not been sterilized, only sanitized. Use within 24 hours when possible. Higher gravity beer requires more yeast, and the yeast needs to be stronger to ferment the more potent brew. 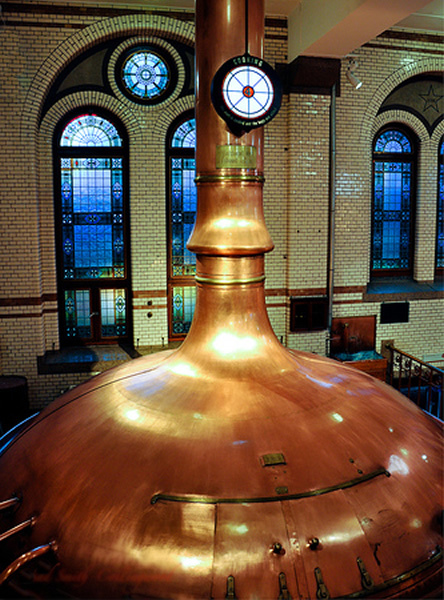 Beautiful Antique Copper Tank in Dutch Brewery. Bring water and DME to a boil in an open saucepan or boiler, stirring briefly to dissolve the DME. Boil for 10 minutes. Note: DME attracts moisture rapidly – it’s hydroscopic – the DME will clump if not resealed very well for storage. ALERT: Boil-overs may occur if there is not enough room to contain them in your pot. Use a larger pot than you may think is needed. You can withdraw pan from heat briefly to control a potential boil-over. Place the pot with lid on it into a sink with cold or ice water. Change water as needed to keep cool. Pour the DME mixture and yeast together into a jar, cover with aluminum foil or lid and shake well. Hold the foil on tightly to prevent spilling, relax the lid (if used), after shaking. Do not use an air lock. It will prevent oxygen from entering your starter. Shaking the jar every hour or two will increase the yield of yeast significantly. If you wish to get fancier (more expensive), use a stir plate and lab flask for an even greater yeast count. Swirl the yeast and slurry, then pitch (dump or pour) when your wort is transferred (poured, pumped, or siphoned) to the primary fermenter. Here’s a chart for a visual aid. Just make sure and place a lid on the pot when cooling! Making a Yeast Starter is just one of many fun and informative articles you can receive free in Black Bucket Brew e-Zine. Subscribe Now for your free emailed copy!